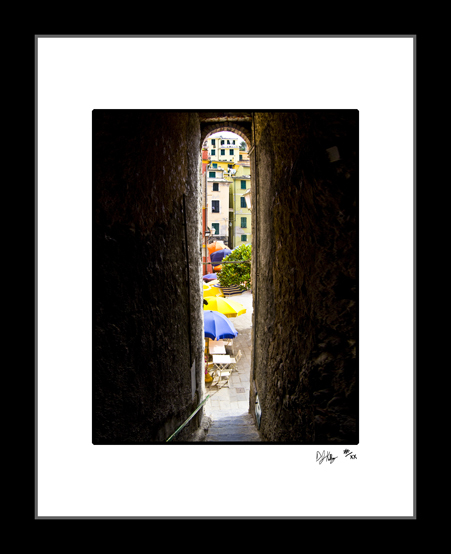 This photograph looking through a small arched walkway in Vernazza, Italy charm of the coastal towns of Italy. In this picture the colorful umbrellas of a typical square can be seen past the dark narrow street. The towns of Cinque Terre stretch from the ocean all the way up into the mountains above the sea. The town of Vernazza is connected to the other towns of Cinque Terre by rugged paths used for centuries before roads were built. This colorful photo shows the stunning beaches, coastal town, and the mountains that make the Italian sea famous.